Want to own a yacht without the hassle of looking after all of the day to day running activities? Do you dream of just turning up and going yachting knowing that everything is in hand? Well, we aim to take away all of the stresses and worries of owning a yacht so that all you have to do is relax and enjoy your time on the water, wherever in the world you happen to be. Never worry about logistics, financials or maintenance again – let Ancasta handle everything from the commissioning of your new yacht, the day-to-day running of it, berthing, crew management, repairs…anything and everything! 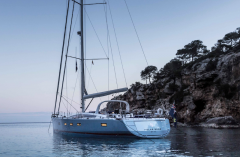 This is a great ownership option for those who don’t want their yacht to be used by anyone else but don’t have the time to look after it on a day to day basis.